Vietnam has started renovating an old airport on the highly-disputed Spratly islands, it said on Friday. Vietnam recently started sending small groups of tourists to the archipelago, and said the airport would enable it to fly more visitors in. 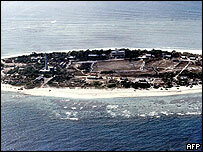 The tourism plans provoked protests from some of the five other countries that claim the South China Sea islands. The archipelago straddles vital shipping lanes and is believed to contain vast oil and gas reserves. Vietnam has begun work to bring a disused 600m (2,000-foot) runway on Truong Sa Lon (Big Spratly) island back into working order. "It is a small airport that was used by South Vietnamese forces during the Vietnam War and was captured in 1975," said Duong Xuan Hoi, of Vietnam's tourist ministry. "The Army Air Force is now renovating it for tourism purposes. When it is finished small aircraft will be able to land there," he said. Tourist officials said the development could open the way for Vietnam Airlines to run commercial flights to the Spratlys. The islands, which amount to less than 5 sq km (2 sq miles) of land, lie 450km (280 miles) off Vietnam's south-eastern coast and have no indigenous inhabitants. Besides Vietnam, some or all of the islands are claimed by China, Taiwan, Malaysia, the Philippines and Brunei. The Asean group of South-East Asian Nations has committed to try to work out the sovereignty of the islands, but some of the countries have been staking their own claims. Taiwan has constructed a house raised on stilts on one of the islands, the Philippines has held military exercises nearby, and China has been erecting markers in the area. All except Brunei have military personnel on some of the 100 islets, reefs and atolls, which include Mischief Reef, Fiery Cross Reef and Flat Island.